When you use a computer, your eyes become fatigued. Of course this happens when looking at a screen from a close distance for prolonged periods of time, but the effect is much stronger on a computer compared with other devices such as TVs. So how do we reduce eye fatigue? At EIZO, we have researched the causes of eye fatigue in order to create the ideal monitors that are “easy on the eyes." LED backlight causes eye fatigue? Since the popularization of LED backlights, the number of people who report eye fatigue caused by flicker has increased. Some people perceive the high speed at which the LED backlight flashes as flicker. Of course, even those who cannot perceive flicker may also be affected by it without realizing it. Dimming (brightness control), is separated into 2 categories: PWM (pulse-width modulation) and DC (direct current). LED monitors often use PWM. The design is simple and easy to mass produce. Does flicker really cause eye fatigue? We conducted an experiment to find out how users felt about viewing variable light. Did you feel eye fatigue? Lastly, which was the easiest to view? We have developed a hybrid model that combines the pros of PWM and DC dimming. A bright screen causes eye fatigue? At first glance, a bright screen seems clear and easy to see. However, a screen that is too bright is a primary cause of eye fatigue. On the other hand, if a display is too dark it is too difficult to see and also adds to eyestrain. At EIZO, we tested the effects of our Auto EcoView, which automatically adjusts the screen's brightness to an appropriate level in response to ambient lighting. How was the level of fatigue and the readability? Most of our general-purpose monitors come equipped with Auto EcoView, a brightness sensor. Auto EcoView ensures the screen is never too bright or too dark; it automatically adjusts the screen's brightness to the optimum level, alleviating eye fatigue caused by working at the computer for long hours. Blue light causes eye fatigue? 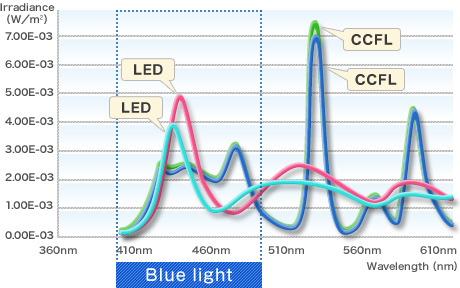 How blue light influences eye fatigue is an increasingly popular topic. First we will show where blue light falls on the light spectrum. Blue light is part of the visible spectrum and has a wavelength that is close to that of ultraviolet light. 99% of the ultraviolet rays that reach the Earth are UVA with a wavelength of 315 - 400nm. Although blue light is part of the visible spectrum, it still has an influence on eye fatigue. Since its wavelength puts it close to UVA, it is conceivable that it could cause strain on our eyes. 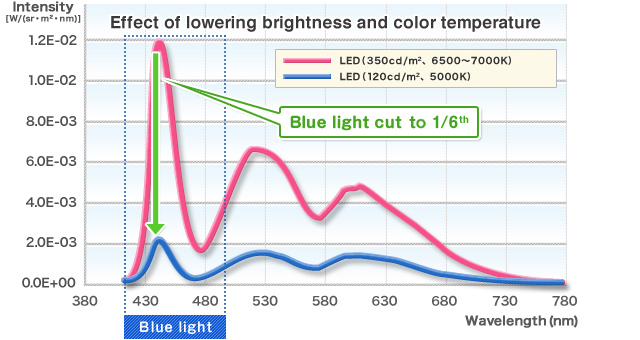 When comparing the relationship between LED and blue light, we have confirmed that LED backlights and CCFL backlights have about the same amount of blue light. Knowing that blue light influences eye fatigue, we tested how much we could decrease the amount of blue light by making adjustments to the monitor. We greatly adjusted the monitor's brightness and color temperature resulting in a reduction of the effects of blue light using various technologies. We were able to create a comfortable viewing environment with Auto EcoView automatic brightness adjustment and Paper mode, part of Fine Contrast presets. Equipped with multiple solutions to combat eye fatigue, the FlexScan EV Series combines eco with ergonomics for high quality monitors you can trust.